Kokopelli Rock Art Site is located in Colorado, United States near these coordinates. 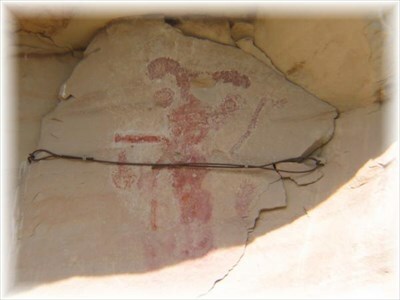 The figure of Kokopelli is often associated with Anasazi mythology. His appearance at this site indicates a tie with other civilized cultures in the four corners region of the southwest including the area of Mesa Verde. Some scholars believe that Kokopelli was a traveling trader carrying a pack and entertained his customers by playing his flute. Still others believe him to be a trickster, a seducer of maidens, a fertility symbol, a rain priest, or even a hunting magician! Theories abound but the only real evidence is the Rock Art itself. What do you think? This site has several interpretive signs for studying the cultural history of the area. The main Kokopelli Rock Art panel has been reinforced to keep it from falling from the cliff face. You will notice a large cable bolted to the rock across Kokopelli’s midsection. There are more Freemont and Ute painted and pecked figures at this location. Not much exercise here – very easy access. There is a BLM sign directly along Colorado Highway 139 and a parking area across the road from the Rock Art panels. The listed coordinates are from the parking area directly across from Kokopelli. As always with this and other Ancient Rock Art, remember that it is very Fragile and deserves our utmost respect. Take only pictures and memories! Do Not Touch as even the oils in your skin can cause the paints and rock surfaces to deteriorate. Erosion and weathering have taken a toll on many of these sites but people touching the sandstone and ‘outlining in chalk’ causes much more damage! Be Prepared as you Adventure into this vast rugged region of SouthWestern America. Carry Water, Have a Plan and, Let Someone Know where you are heading.